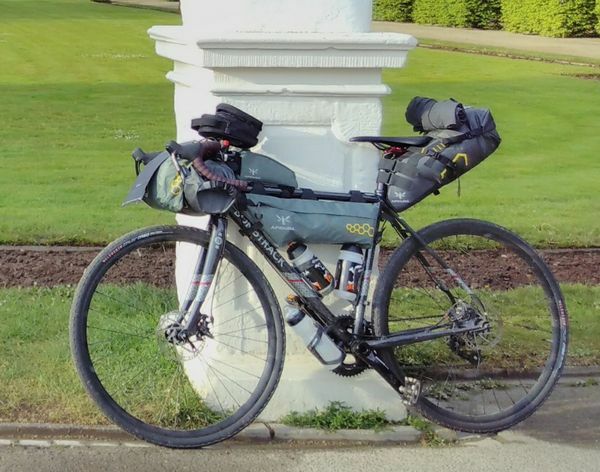 Bikepacking means to me to travel with little baggage on almost all kinds of roads/trails and to spontaneously choose my route and the location to stay overnight. It is a wonderful way to travel and explore the nature and culture of a country, to meet interesting people, and to get to the borders of your comfort zone (i.e. getting to know yourself again and again…). Well, I used a Bombtrack Hook 1 bike which gave me a very robust CroMo steel frame, nice Clément cyclocross tires that run excellent on both tar and gravel roads, robust SRAM front (50/34) and rear (11-32) gearing, and a very comfortable but still race-like frame geometry. My goal was to find as many gravel roads as possible, but also use many tar roads for convenience and for making some more distance in shorter time. In order to have an independent power supply I carried a solar panel. With it I charged a battery pack, which in turn I used to charge my Fairphone. I could adaptively attach it to the handle bar pack or to the saddle pack, depending on my orientation with respect to the sun. On the Fairphone I ran Locus Map, which was my only means of navigation. Weight of this set (excluding food and water) was about 11 kg, which was about the same as weight of the bike. 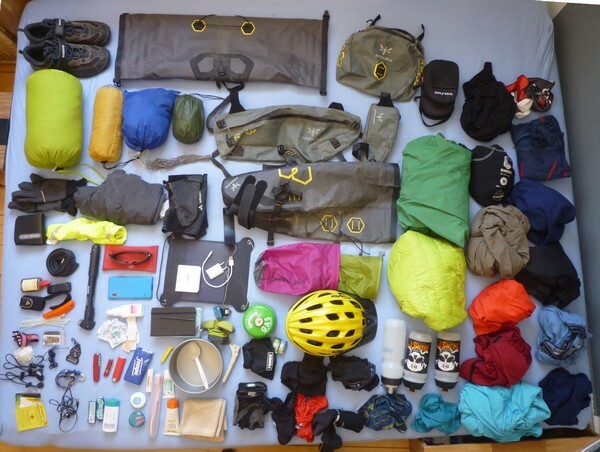 As the bags were tied very close to the frame and carried relatively little weight, it resulted in very comfortable riding experience with great maneuverability and versatility (which is the main ingredient of bikepacking, really). As it was my first bike trip at all. I bought the bike and all the bags only shortly before the trip, having been unsure about its interplay and comfort. At the end of the trip, I must say, all the decisions I had made worked out well. The bike ran so nicely, the geometry was very nice and the bags served me well and kept the stuff dry (the waterproof bags at least). 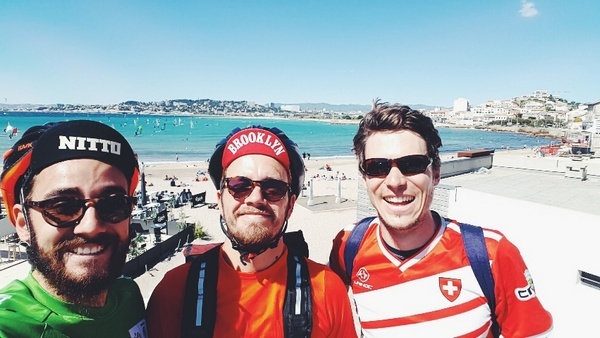 I’ve lived in Hannover (Germany) for the past five years and Marseille sounded like a great place to ride to with both the sea and warm temperatures waiting. The route therefore was relatively moderate regarding mountains and steep ascends as there are many big rivers along the route such as the Rhein, the Mosel or the Rhone. It gave me enough confidence to find a good route on the fly and plan the targets for the day on a day-to-day basis by consulting the offline “LoMaps” within the Locus Map app. Locus Map gave me the option to easily customize the panel on the map screen for fast access of the most used tools. I used ones shown in the screenshot of Locus Map above. I often shared my actual location with friends and family. I tagged all my overnight places along the route with some additional comments. As I wanted to save power when riding and thus not recording my tracks by GPS positions, I drawn the daily tracks manually on the train back to Hannover. A possibility to avoid power supply problems would be to install a hub dynamo USB charger. 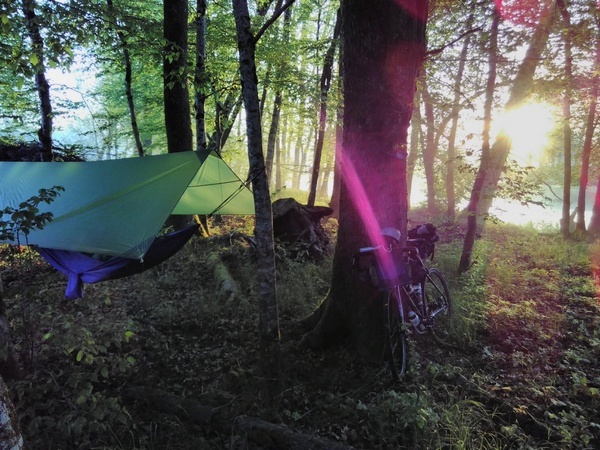 My goal was to sleep mainly in my hammock as it is flexible, maximally cheap and is the most legal way for free camping (see info in German >>). Some cities even have camp grounds close to the city where it is possible to stay overnight spontaneously and legally for little money. Mostly I was looking for some optimal forests in the area on Locus Map. This worked out very well. 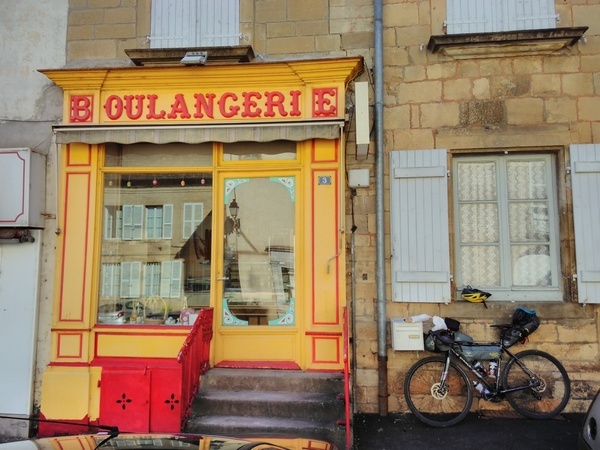 On a bicycle one can reach places relatively fast but it still gives the possibility to feel the nature by smelling, stopping fast (grab some nice bread from a “boulangerie”), making flexible detours into the woods/grasslands or explore the small alleys within a city. Cyclists usually like to help other cyclists (especially in France). I got three free nights from randomly met cyclists that took me to their home and showed me their city and family. We also had very nice conversations about my or their cycling experiences, including the cyclist social platform warmshowers. I once found a perfect forest for my hammock, but after looking around a little, I found some turned around boxed on the forest floor. I lifted the boxes and discovered little dead boars, which in turn let me rethink the perfectness of this forest and I decided I had better choose another one. I started my trip with full joy, full motivation, and also full strength. These were the ingredients of fast riding, which I joyfully did for about four days, before I had to discover a slight and steadily growing pain in my knee. This was the point where I learned to pedal with a pace that suited better to my fitness and to listen to my body. I discovered quite painfully on the 4th day of my trip that my Clément tires were no marvel either, as they slipped on wet ground with too much speed. Thereafter, I struggled with myself to get optimal healing conditions to all my wounds and also optimal riding condition. This type of travel gave me really a lot of freedom. Of course, I had to obey the rules of my body, my bike, and the nature (and mostly of the law). But it gives you so much possibility to discover nice places, meet interesting people, and to just be with yourself and enjoy riding the bike. And Locus Map perfectly assisted me in all of my little adventures. Stromversorgung: alternativ zum Solarpanel und viieel effektiver und leistungsfähiger ist ein Nabendynamo (SON28 optimal) kombiniert mit dem Vorumslader V5 (siehe WEB). Der V5 ist ein für Radfahrer optimierter Lader, der am Dynamo angehängt wird und einen extrem hohen technischen Stand hat (Ladewirkungsgrad ist beeindruckend, ebenso die radfahrpraktische Auslegung des Laders). Schriftgröße und Größe der Kartensymbole kann man in Locus individuell einstellen. Höhenlinien enthalten praktisch alle nutzbaren Karten (vector und pixel). Höhenlinen kann man auch anschalten oder abschalten, je nachdem, ob man im Wander- oder Radmodus unterwegs sein will. Das Aufzeichnen des gefahrenen Tracks während der Fahrt kann man stromsparend durchführen, wenn man das Gerät mit gestartetem tracking ausschaltet. Das tracking läuft dann im Hintergrund weiter, sofern man das in den Einstellungen von Locus auch so eingestellt hat. Wesentlich ist dabei, dass das Display ausgeschaltet ist. Mit meinem S7 kann ich mit einer Akkuladung dann gut 10 Stunden ununterbrochen aufzeichnen. Orthopädische Ausfallerscheinungen (Knieschmerzen etc.) kann man ggf. vorübergehend mit dem cox-2-Medikament Arcoxia (60/90/120) beheben. Im Gegensatz zu den (üblichen cox-1) sind die neueren cox-2 zwar teuerer, aber in der Wirkung schmalbandiger und treffsicherer und in den Nebenwirkungen entsprechend schonender. Gruß und weiter viel Freude beim Radfahren.